PAN India 3G service provider - BSNL activated more than 2 million new mobile connections in October 2016. BSNL is adding more than 2 million new customers continuously from July 2016. As we reported earlier, the entry of Jio is not a big threat to BSNL. This can be clearly seen from the excellent performance of BSNL in new subscriber addition. The PSU is focused on increasing its data revenue from mobile segment. 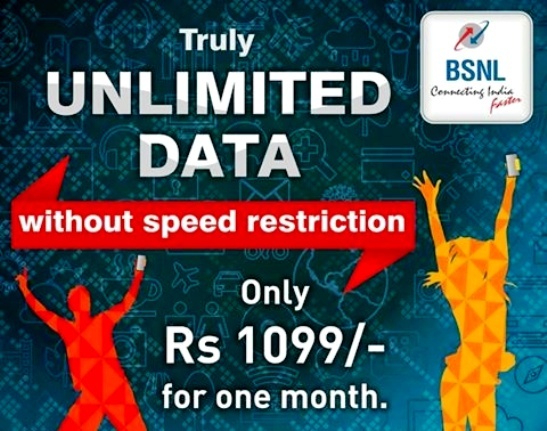 BSNL is the only operator offers TRUE UNLIMITED 3G Data pack (New Unlimited 3G Data STV 1099) without any speed restrictions. Among 22 telecom circles, 4 of them have crossed their assigned target which includes : Jharkhand (127%), West Bengal (106%), Orissa (104%) & Andhra Pradesh (102%). Andaman Nicobar, Punjab, Haryana, Karnataka & Gujarat circles have also performed very well and just marginally missed the target. BSNL started showing positive signs of revival form June 2015 on wards, after the launch of Free All India Roaming Scheme for its Prepaid and Postpaid Mobile customers. As per latest TRAI reports, BSNL registered tremendous growth in gross mobile connections per month during February, March, April, May, June & July 2016. MNP (Mobile Number Portability) figures are also positive for BSNL since last year. FREE All India Roaming (Voice & Data) and Lowest 3G Data Tariff are the attractions of BSNL Mobile Services. More and more new customers are being added to BSNL Network from other operators through Mobile Number Portability(MNP). Recently launched Student Special Plan has already made its presence among the youth segment since it offfers 1 GB free 3G Data along with lowest voice call rate of just 10ps/Min. Based on the encouraging feedback received from various telecom circles, BSNL has set the target of 3 million new subscriber addition in coming months. I really wondering to see that still the people are going for BSNL SIM if above mentioned calculations are correct since JIO is being given the SIM with unlimited call and internet till March end 2017 freely.